Network Throughput - What is It, How To Measure & Optimize for Speed! 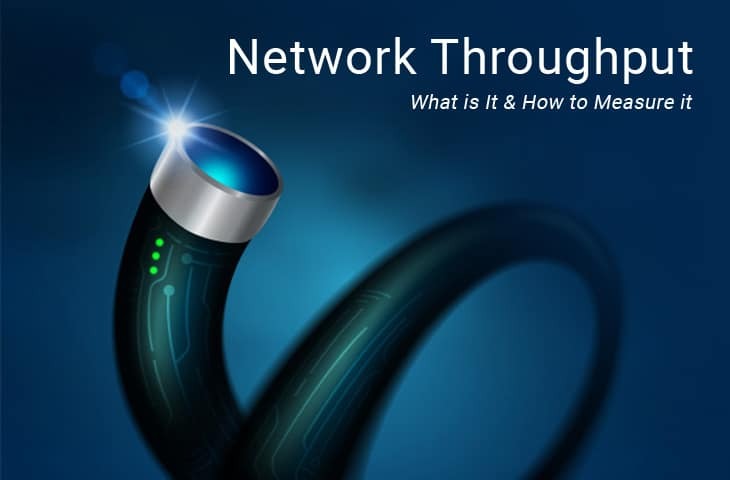 Network Throughput – What is It, How To Measure & Optimize! When people describe their web browsing (or general Internet) experience, they usually speak in terms of speed, saying something like, “My Internet connection is really slow!” However, this thing they call “speed” is as a result of many networking-related elements including bandwidth, throughput, latency, packet loss, and so on. In this article, we will be looking at one of those factors that affect the speed on a network – Network Throughput. According to the Google dictionary, Throughput is defined as “the amount of material or items passing through a system or process.” Relating this to networking, the materials are referred to as “packets” while the system they are passing through is a particular “link”, physical or virtual. Furthermore, when discussing network throughput, the measurement is typically taken per unit time, between two devices, and represented as Bits per second (bps), Kilobit per second (Kbps), Megabits per second (Mbps), Gigabit per second (Gbps), and so on. So for example, if a packet with a size of 100 bytes takes 1 second to flow from Computer_A to Computer_B, we can say the throughput between the two devices is 800bps. Note: 1 byte is equal to 8 bits. Therefore, 100 bytes is 800 bits, resulting in the throughput calculation of 800 bits per second. Looking at the description above, one question that comes to mind is, “What is the difference between bandwidth and throughput?” To explain this difference, let’s use an analogy of water flowing through pipes. Considering the two pipes shown above, which pipe do you think will pass more water through it? The default answer is PIPE B because that is a fatter pipe. However, the real answer to the question is that “it depends”. If water is flowing at maximum capacity through both pipes, then PIPE B will carry more water through at a particular time. But what if much more water is coming in to PIPE A than PIPE B? Or, what if there is debris in PIPE B that is restricting the flow of water inside the pipe? In summary, we can conclude that in ideal conditions and at maximum capacity, PIPE B will carry more water than PIPE A. However, any number of factors can cause more water to flow through PIPE A per unit time. Using the analogy above, Bandwidth can be compared to the fatness of the pipes (i.e. the maximum and theoretical capacity of the pipe) while Throughput is the actual amount of water that flows through per unit time. Therefore, even though bandwidth will set a limit on throughput, throughput can be affected by a host of other factors. Now that we have seen the difference between bandwidth and throughput, let us now take a detailed look into some of the factors that can affect the throughput on a network. Like we said above, bandwidth (or the theoretical capacity) of a particular transmission medium will limit the throughput over that medium. For example, a FastEthernet interface provides a theoretical data rate of 100 Mbps. Therefore, no matter how much traffic needs to be sent over that interface, they cannot go over the 100 Mbps data rate. In reality, the practical data rate over such an interface will be about 95% of the theoretical capacity. Let’s assume an organization wants to purchase a 3 Mbps link capacity from an ISP, through what medium will the ISP deliver this capacity to the organization? The likelihood, based on current technologies, is that the ISP will use a medium that can theoretically deliver more capacity than the 3 Mbps being requested (e.g. MetroEthernet on 100 Mbps interface). As such, the ISP will use other features to enforce the 3 Mbps capacity on the link which will, in turn, affect the throughput on that link. The degree of congestion on a network will also affect throughput. For example, the experience of a single car on a 4-lane highway is much better than when there are 100 cars on the same highway. As a general rule, the more congested the network is, the less throughput will be available on that network (when viewed from the perspective of a single source-destination set). Latency (or delay) is the time it takes for a packet to get from sender to destination. For some types of traffic, the higher the latency on the network, the lower the throughput. Let’s take TCP for example: before another stream of packets can be sent from source to destination, the previous stream must be acknowledged. Therefore, if the acknowledgment is delayed, the average throughput measured over time will also reduce. The throughput of other kinds of traffic such as UDP is not necessarily affected by latency. Similar to latency, the throughput of certain kinds of traffic can be affected by packet loss and errors. This is because bad/lost packets may need to be retransmitted, reducing the average throughput between the devices communicating. Both latency and packet loss can be affected by a host of factors including bottlenecks, security attacks, and damaged devices. The protocol used to carry and deliver the packets over a link can also affect the throughput. Examples include the flow control and congestion avoidance features in TCP, which can impact when and how much data can be sent between two devices. You may decide to measure throughput for a variety of reasons including determining bottlenecks in a network, verifying service level agreements (SLAs), assessing network performance, and so on. For example, I was once called in to consult on a network where the organization was not feeling the effect of the 100 Mbps capacity they were purchasing from their ISP. Upon investigation, we discovered that one of the interfaces on the edge router was faulty. We were able to make this discovery by measuring the throughput between devices connected to different ends (interfaces) of the router. This revealed a 70% drop in throughput, isolating the problem to that device. There are several tools available to measure network throughput including SolarWinds Network Bandwidth Analyzer Pack, pingb, and iPerf. 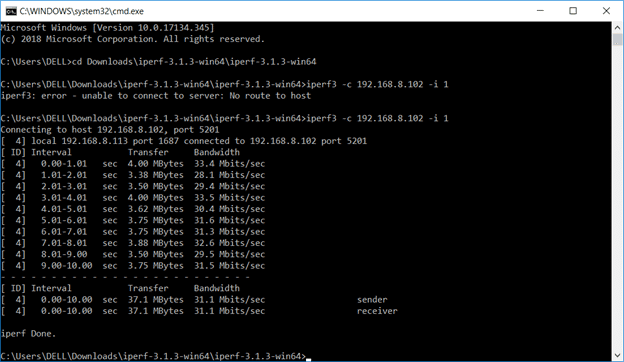 I particularly like iPerf based on experience (it was the tool that revealed the 70% throughput drop above) so let’s quickly see how this tool works. It requires a client and server to function. This just means you need two devices to measure throughput using iPerf – one running as a server and the other one running as a client making requests to the server. Note: On a Unix-based system (and MacOS), you need to run the file as an executable using “./” On the Windows OS, typing “iperf3” should be fine. Alternatively, you can specify the full filename as “iperf3.exe”. iPerf is fine when you are able to get two computers on both ends of the network that you want to take measurements on. However, what if you want to measure throughput between a computer and another device that cannot run iPerf, for example, a router? This is one of the limitations of iPerf. Of course, you can try to get a free interface on that router and connect a computer to that interface but this is not always feasible. In such cases, you are better off using alternatives such as pingb which only requires one device as long as the other device can respond to ping packets greater than 1500 bytes. Bandwidth can be increased to provide more throughput especially in cases where the network is overloaded i.e. the bandwidth cannot support the load on the network. Bottlenecks should be identified and removed from the network. This will go a long way in reducing latency and packet loss/errors, and thereby reducing congestion on the network. Note that bottlenecks can be as a result of medium limitation e.g. using 100 Mbps interfaces instead of 10 Gbps interfaces. Faulty devices/components should be replaced and overburdened devices should be upgraded. Quality of Service (QoS) can be applied to ensure that critical traffic is unaffected by network congestion. While this will not improve overall throughput on the network, it will ensure good throughput for critical traffic. This brings us to the end of this article where we have discussed Network Throughput. We have seen that while bandwidth is the theoretical maximum capacity of a link, throughput is the actual data transfer rate on that link per unit time. We have discussed how bandwidth, latency, limitation of the transmission medium, and other factors can affect throughput. Finally, we discussed how throughput can be measured using tools like iPerf and pingb, and also how to optimize throughput in your Networks.